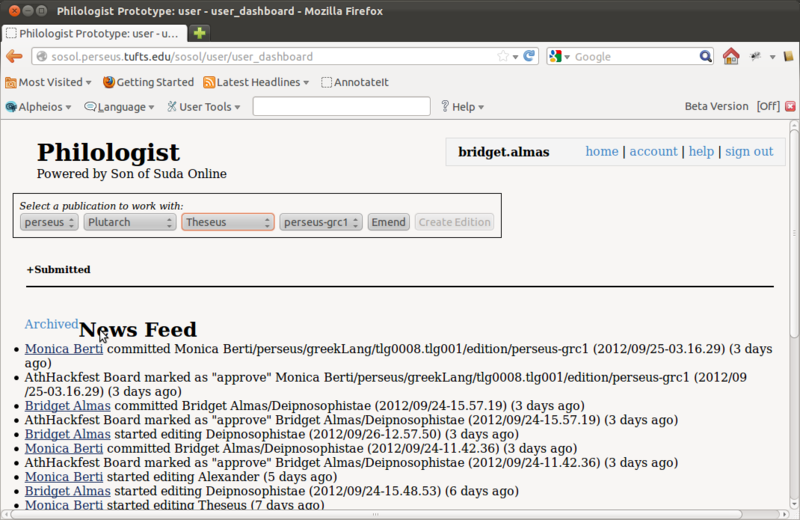 The Edit/Annotate link will you bring you directly into the Edit/Annotate screen for the selected passage in the SoSOL interface (after prompting you to login). At this point, you can proceed to create or edit your annotation. 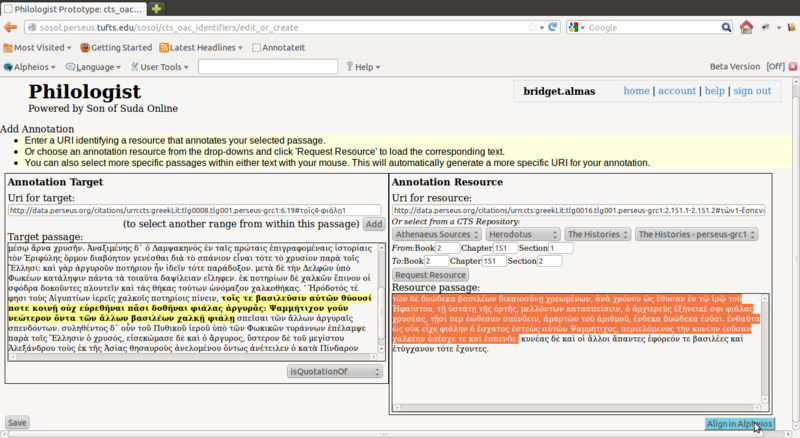 The URI input box for the annotation target will be pre-populated with the URI for your selected passage. If you want to reference the entire passage, you don’t need to do anything further for this URI. If you want to specify one or more more specific passages from within the passage, click and drag your mouse in the text box to highlight the word or words you want. 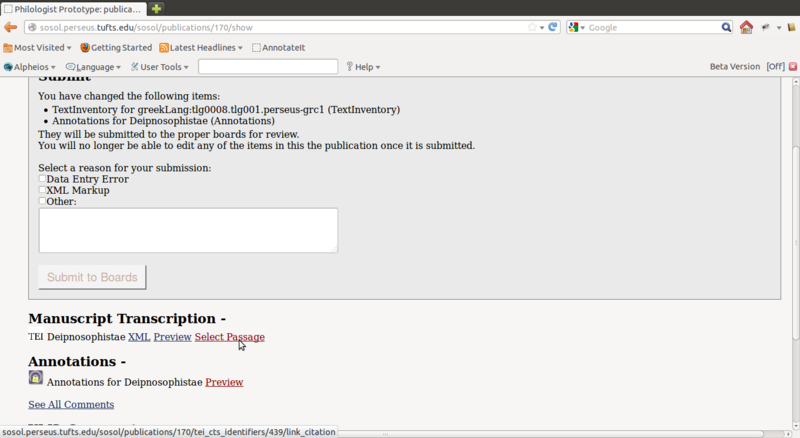 This will update the URI for the annotation target to include the selected words. 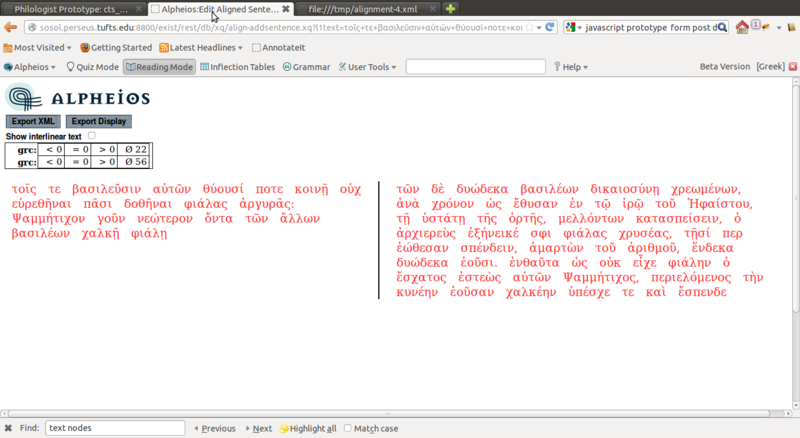 If you want to select multiple smaller passages from within the passage to serve as the target of the annotation (e.g. for broken phrases, etc. 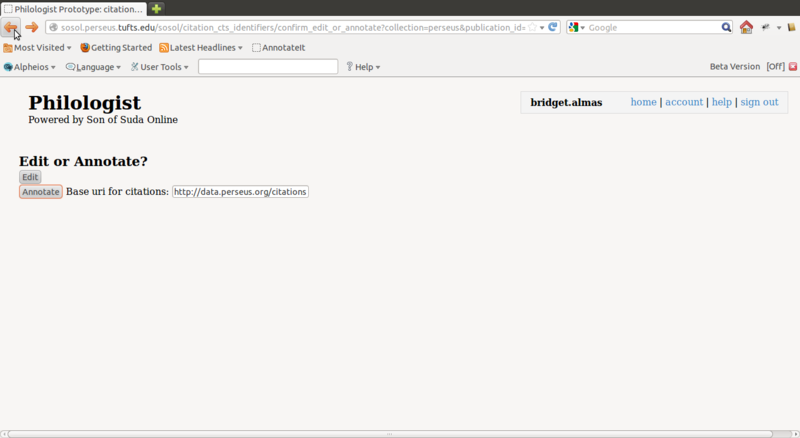 ), click the ‘Add’ button below to the URI input box. It will add another target uri input box below the first. 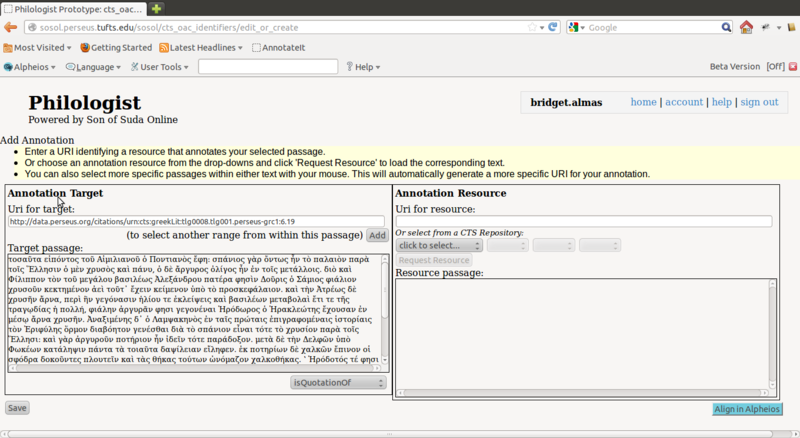 Select the new range of text with your mouse, and you will see that it updates the new annotation target URI input box. Clicking in any of the target URI input boxes should cause the text corresponding to that URI to be highlighted in bold in the passage below. Click the ‘Remove’ button below a URI if you no longer want to include it in your annotation. 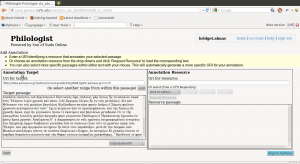 Select the title for the annotation from the dropdown (choices for the hackathon are ‘isQuotationOf’, ‘isSpokenBy’,’isReferenceToPerson’ and ‘isReferenceToPlace’). 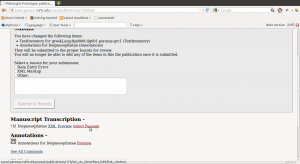 You need to supply a URI to a resource which represents the body of the annotation. 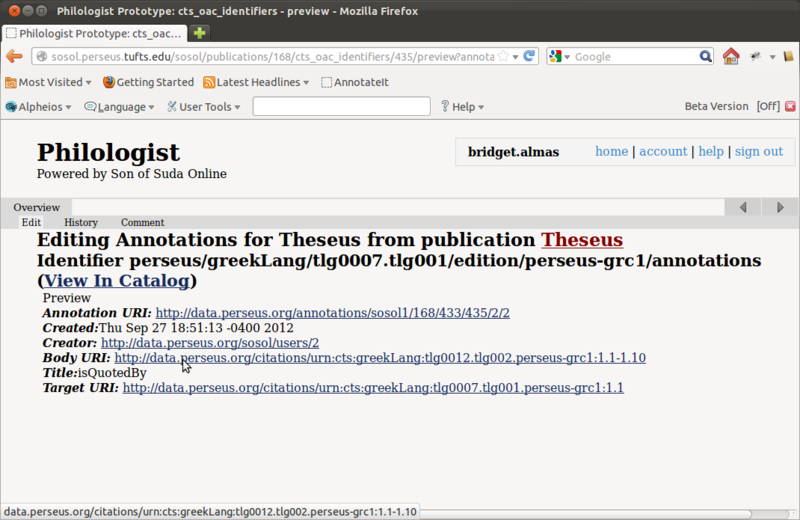 Use the selection boxes to select passages from Homer or Herodotus texts from the Perseus repository. After entering the passage or passage range for one of these texts, click on ‘Request Resource’ to populate the form with the URI for the passage and to retrieve the text from the repository. 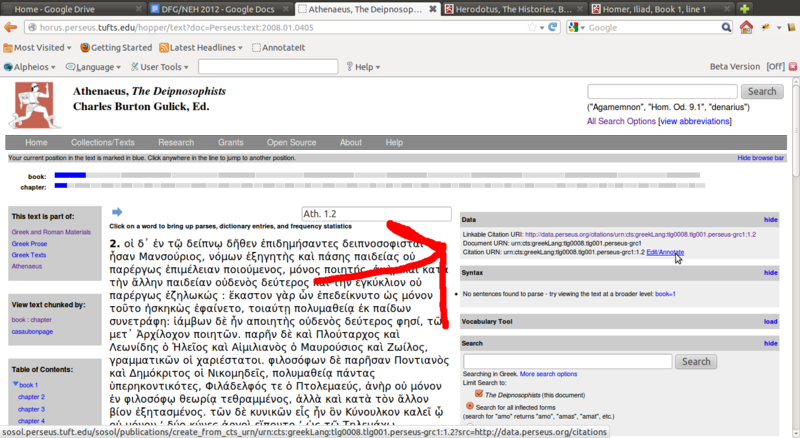 To select a more specific passage from within the text, click and drag with your mouse to highlight the word or words. When you release your mouse button, the CTS URN in the annotation resource URI will be automatically updated to include the selected words. When you are satisfied with your selection(s), submit the form by clicking the ‘Save’ button at the bottom of the page. The annotation is saved to your repository and you are brought to the Preview display. When you are done creating annotations for a text, you can return to the overview screen for the text, and then follow the instructions to submit your work for review by the board. 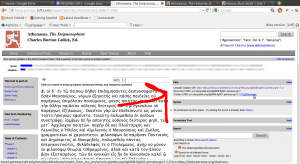 Note however, that until the annotations are approved and added to the repository, you will not be able to work further on that text, unless you withdraw it from review. 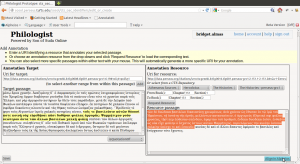 An alternative annotation workflow is available for annotations which have many-to-many relationships between tokens in the two linked passages. For these, you can use the Alpheios Alignment editor to match up the tokens in each by clicking on the Align in Alpheios link at the bottom right of the screen. 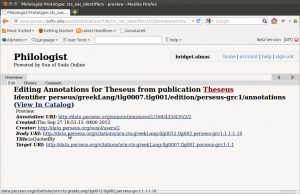 We don’t yet have the ability to put the results of the Alpheios editor back into SoSOL, so for the moment you will have to save these locally to your computer by using the Export XML button, and then submitting the XML via email.